Hey DoS Community! Kalamere has been nice enough to make an update to the standings! As you can see we now have a cycle ranking system much like the RoK rankings in DoM! If you'd like to see the new Cycle Rankings tab, please visit the DoS Standings page(link). So first off I'd like to give Kalamere a big shout out and thank him for this! Secondly, I'd like for the DoS community to come together and think of a prize! Something to be given out for the top duelist who's at or above a 50% win rate, while having over 8+ duels at the end of the cycle. And what about those who brave the sport while opting out of the no loss system? Should they get a bonus for coming out on top at the end of a cycle? Come at us with your ideas! Edit: Fixed a few mistakes and added the part about needing to be in the top 8+ duels bracket, since I was dumb and forgot it. Re: DoS Community Discussion: New Cycle Rankings tab and possible prize talk. I like the idea of a challenge right, but not test-free. I'd say it's a right to challenge if won by someone below Warlord, or a grantable right if won by a warlord of higher. Alternatively, if a warlord, they get a challenge and the right to name their own champion if tested. Actually, reading the Lost Memento makes me think of another avenue to go with the "fight as a baron" idea. Maybe they win the <insert interesting item name> that allows them to step in on a challenge once during the course of the cycle. Meaning they can apply their own test or worthiness to a challenger and act as a roadblock as the OL would, or they can step in to perform the right to challenge as a renegade baron would and defend someone else's challenge right. I like the Lost Memento as a potential prize. Could be a mixture of both? An item that can be held throughout the cycle that can be used for either a challenge with the option of being able to name your own champion, or can be used to act as a champion for a challenger / for a title holder? So a player can hold onto it and choose what sort of perk they'd like to use it for. Seems reasonable and I like the choice, given the opportunity for one or the other may not come up in a given cycle. I would make it a one shot thing though. I think you indicated that, but I wasn't positive in the phrasing. Yeah. It'd be a one shot with an one or the other choice stipulation. The idea was to have it act like a cycle-long bonus for the winner and would no longer be usable once the cycle came to an end. Would this be a good idea or should it be something they can hold onto? It'd be pretty easy to track I suppose, but I'm wondering what could happen if someone held multiple. I'd just say they have it for a cycle, since it's a cycle based reward and somebody else gets to play for the next go around. In that sense it's sorta like the baron title rights themselves. While you're a renegade baron you get to insert yourself into the test of worthiness and champion the challenger. If that scenario never presents itself while you're a baron (or before you turn loyal), then you never get to use the power. Luck of the dice in that one, but you still get bragging rights and a nifty title or object to hold onto for 3 months. Bumping this thread. The cycle will be coming to an end in a few weeks so if there's anyone with ideas of possible prizes please feel free to respond. I'm still trying to think up a name but for now I'll just call it the Golden Ticket. 2. Maybe you're not interested in a title or like who are currently sitting in the top spots? Your other option is to become the Champion or issue a Test of Worthiness in a challenge yourself. You hold the ticket and you find your favorite title holder under challenge? They might be a Renegade Baron, they might even be the Overlord! The former wouldn't have the ability to gain a test of worthiness, the latter may not choose to issue one. With your ticket you become the decision maker and are able to step in and force a challenger to fight you as a test. The holder of the ticket will only be able to do one or the other once during the cycle. It could use better writing, I'll give that. But how does this look? I think it'd be neat to be something wearable that the winner could show off if they wish. Not a ring, but maybe a medallion or something? That's totally something that can be workshopped in. I'll put this suggestion somewhere and be sure to bring it up once the perk stage of the discussion is over. I really, really like this idea and I think it's something the DoS community can come together for and discuss (and maybe vote on) a possible item that can be associated with the prize. Thank you for your reply! I think a one-time use item rewarded once per cycle allowing someone to test a challenger(baron or overlord) or step in as a Renegade to counter a test is an awesome idea. I think what we need are some fun ideas to incorporate this into the lore and give people an item to use, something memorable. "Lost for decades this haunting memento has been recently re-discovered in the Arena's storerooms. Brandishing some of the finest silversmithing Rhy'Din has to offer- it's origins remain shrouded in mystery. Attempts to date this artifact have yielded no certain results. On the front there is ornate Latin which reads, "Audentis Foruna Iuvat, Fortune Favors the Brave". The only clue as to it's pedigree is a single word, or name, etched in its back beneath the crown. Dalamar." Not that I have any issue with honoring Dalamar in some way, but (a) I can't say for sure that the symbol selected is one he'd approve of or not and (b) am not sure he's the best one for this honor. While Dal was our most successful Overlord, I see the abilities of this thing as more in line with testers and defenders of the right to challenge. With that in mind, I'd suggest Billy Ray Karnafexx (BRK) as the more appropriate name to get tagged to it. Fighting the ToW was sorta his claim to fame. BRK used to fight with sap gloves.. which doesn't lend itself terribly well to the visual here. But maybe a brass knuckle cloak pin or pendant. This is why you need to be online at like 3am Kal That's more along the lines of who I was looking for but by combing through only the histories for Overlord, when I found Dalamar's first stint I kind of just ran with it. I don't know nearly enough about most of the previous duelists to know who to honor with this. My initial thought was "who was a big deal with tests". I'll cook up something new tonight for BRK. Knowing very little about these characters though my goal was to pick something that may or may not have even been related to them. The Signet may be just misrepresented as Dalamar's, maybe it was someone who admired him, loved him, hated him? I like the mystery behind it. I'll pick something that's accurate to BRK, but the hope is that they're honored in name and in principle but still have a bit of questioning around the origins. Hopefully it gets people thinking so they will offer up other ideas for these story tethers. I think it would be really, really cool to have a different one every cycle and the person gets to keep theirs forever. "I was the first x", it's not a title in the sense that you can defend it unless you are on top of the next cycle rankings, but maybe it shares that sentiment with the DoF Diamond. You win it, its yours forever. With the cycle coming to a close soon I'll be locking in this choice for the prize. For now we have this on the table from what I've read..
Signet of Karnafexx - "Lost for decades this haunting memento has been recently re-discovered in the Arena's storerooms. Brandishing some of the finest silversmithing Rhy'Din has to offer- it's origins remain shrouded in mystery. Attempts to date this artifact have yielded no certain results. On the front there is ornate Latin which reads, "Audentis Foruna Iuvat, Fortune Favors the Brave". The only clue as to it's pedigree is a single word, or name, etched in its back beneath the crown. Karnafexx. It is unknown of Karnafexx owned this item or if it were created by an adoring fan." Bold added as flavor. Other options being brass knuckles. Which would need an updated flavor text to reflect it. So with the prize itself being locked in to what it does, focus can shift to the item name / description. Should it be something passed down or should it be an item that someone holds on to as a trophy? Having it be something created with multiple in mind, it might be better to say that it isn't a found item and instead one designed for the purpose of being a trophy of sorts each cycle winner gets. 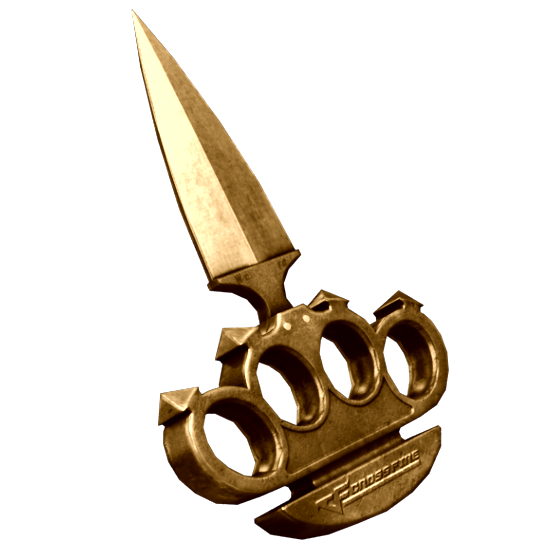 Maybe a blade with brass knuckles attached? If it's a trophy item that each cycle winner gets then it's easier for me to make icons to pass out each cycle for the winner so they can show off.